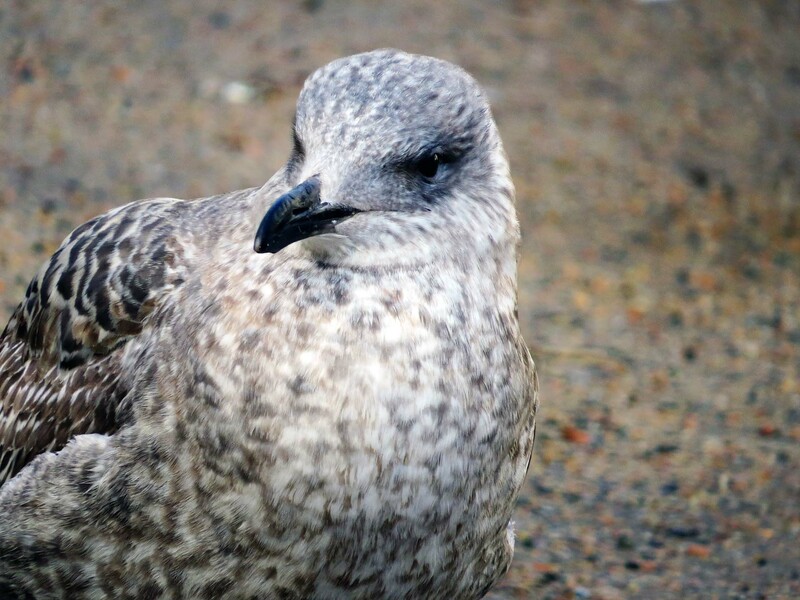 A young gull – a herring gull, I think – still mostly in it’s youthful plumage. It was hanging around with a number of other teenagers (gulls and human) at Brunnsparken waiting for som action. Or food. I originally published the photo for this week at my now-slumbering daily photoblog GBG365 on 17th February 2014. Brunnsparken is a little square in the centre of Gothenburg and is one of the main meeting places in town. Most of the city tram lines and a large number of bus lines entangle the square. A part of Brunnsparken bridges over one of Gothenburg’s remaining canals. The square itself butts up against one end of the Stora Hamnkanal – once the city’s harbour – at the Lion Steps. It’s close to the main square (Stora Torget) and the big shopping centre at Nordstan, and you cross it west to east in order to reach the main railway station at Drottningtorget. It’s not at all surprising this is the place to hang out – whether you’re a gull or a human. If you stand in certain places when a tram rumbles by, you feel how the ground beneath your feet bobs up and down. That’s when you realise you are not standing on solid ground, but on the filled-in junction of two canals that no longer exist. Incidentally, Brunnsparken is one of those Swedish places you (I) have to be careful about writing. I habitually spell it Brunsparken. (I did in the original post on GBG365.) That makes it “The Brown’s Park” – possibly a meeting place for Nazis, but no one else, surely? Actually the name translates correctly as “The Well’s Park” (Brunns-parken) because there used to be a public well for drinking water here. Nowadays the place where the well stood is marked by a fountain with a naked woman (Johanna) and a lot of swans. The swans are in bronze; most of the real birds around here are pigeons and hooded crows. And seagulls, obviously.